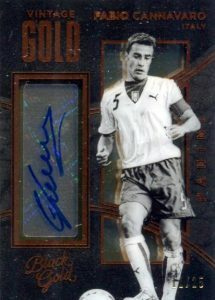 While the brand has been used for several other sports in the hobby, 2016-17 Panini Black Gold Soccer kicks off its run on the pitch. Every hobby box comes with a pair of autographs. Part of the 162-card primary set, collectors can find three base cards and one numbered base parallel in every hobby box. 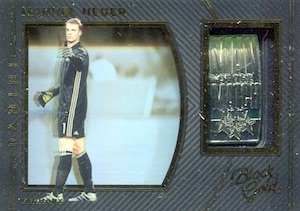 The cards feature player images from their respective club and national teams. 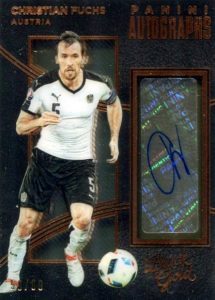 Signed inserts from 2016-17 Panini Black Gold Soccer utilize several themes and designs. In addition to the main Autographs set, Gilded Signatures and Vintage Gold presents other options. Adding a relic to the signature, Memorabilia Autographs showcases a horizontal layout. 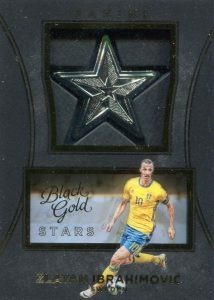 Working with embedded metal medallions, premium inserts drop in each 2016-17 Panini Black Gold Soccer pack. This includes Man of the Match and Stars medallions. Both commemorative relics also offer parallels limited to one-of-one. Although they are not the norm, select female players, like Alex Morgan and Carli Lloyd, also make an appearance in several of the inserts. 2016-17 Panini Black Gold Vintage VG-MAN Miguel Angel Nadal Spain Auto Card!!! PARALLEL CARDS: Bronze #/99, Uncommon #/75, Rare #/35, Black Gold 1/1. PARALLEL CARDS: Bronze #/99 or less, Holo Gold #/25 or less, Black Gold 1/1. View specific parallel numbering with the full spreadsheet. PARALLEL CARDS: Holo Gold #/25, Black Gold 1/1. PARALLEL CARDS: Holo Gold #/50, Black Gold 1/1. View specific parallel numbering options with the full spreadsheet.